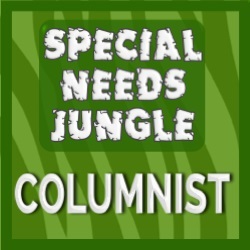 Last week Helen wrote about attention and listening skills in younger, preschool children. You can read that post with some great ideas and strategies here. When children get older and start school, good listening skills are a key factor in academic progress. If you can’t listen to information and instructions, learning is much harder. 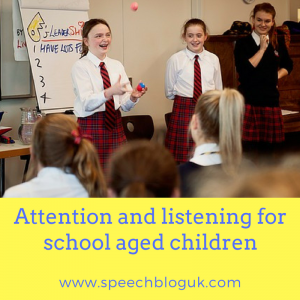 By the age of 6-7, most children have developed their attention and listening skills to the point where they can switch their attention from a task to a speaker easily and can attend to group or class input for a longer period of time. If you want to know more about the stages and development of attention and listening skills read this post. However, many children in infant school are still developing these skills. So how can we help? Start where your child is, not where they should be. Helen mentioned this in the last post, but it is just as important with older children. If your child is older, but still finding it hard to stay at an activity for more than a few minutes, don’t expect them to suddenly be able to jump up to 10 minutes. Work your way up gradually from where they are. If you child is in school, don’t worry if you are working on advice from our pre-school post. Support your child where they are now. Say their name. This may be simple, but can be really effective. Just by saying your child’s name before giving an instruction, you are warning them that something is going to happen that they need to listen to. This strategy works well for both school and home. Use Visuals. Some children may benefit from strategies such as a now/ next board and sand timers as Helen mentioned last week. Some older children may be able to use the clock to monitor how much longer they have in an activity or a digital timer they control. They may also be able to keep on task with verbal now/ next prompts. Again work at the level your child is currently at. If possible, reduce distractions. Now this one can be tricky! But if you child really needs to listen and complete a task, try and reduce distractions in the environment. At home this means turning off the telly and putting phones/ tablets away. It can also mean things like position your child so they can’t be distracted by trees or birds out of the window. At school, again think about the positioning of the child – are they better looking away from doors/ windows? Is there a board that they will stare at rather than working? Eye contact. Many of us expect the person we are talking to, to make eye contact to show they are listening. Just a quick word of warning! For some children, encouraging them to look at you to show they are listening is fine. However for other children this can be too much, and actually by having to make eye contact, it can stop them focusing and listening. Children’s activity levels fluctuate depending on the activity. If it is something they have chosen, they may well be able to attend for ages. However, less motivating activities chosen by someone else are going to be harder. You may want to try some of these activities in a 1:1 with the child first and then bring in other children. Remember at this age we are trying to stretch their attention so they can move from task to speaker and back again more easily. Barrier activities. These are just games, but you introduce an element where one person has to give an instruction or be a teacher and the other person has to listen and complete the instruction. If you aren’t listening, you might get the instruction wrong. When you are the teacher you have to think about the instruction you give and also check if the person has done it correctly – so you are working on a number of skills. Small lego sets can be great for this, I also love mental bloxs and rockin robot. Black sheep press also make some worksheet based barrier activities. Group activities. When your child is ready to work in a group, Helen wrote a great post about activities to try with groups. You can read that here. Auditory memory. This is one aspect of listening. Some children who find it harder to remember/ retain information in their memory also find it harder to listen and attend. Supporting a child’s auditory memory can also help their listening skill. For ideas and strategies for auditory memory, read this post. For games to improve auditory memory, read more here. So have fun supporting your child and always try and extend there skills gradually and work from where they are. I’m not sure if you are saying that your son doesn’t speak at all. If this is the case, then signing may be useful or using symbols and pictures. There is a system called PECS that can be very helpful for some children. There is information about signing here. If he is saying some words then our posts on first words and putting words together may help. 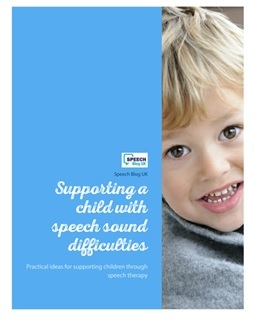 Of course, all of this is very general information – do speak to your child’s speech therapist (or get a referral to a speech therapist if he doesn’t have one) for advice more specific to your child. Good luck.